Frontera Cocina Mexicana by Rick Bayless Dessert Time! Disney Springs. Hands up who always goes for the Churros for dessert at a Mexican restaurant? Well us too, and must say we have had some great ones, but thought that this time we would change it up a notch. So, what did we change up to? 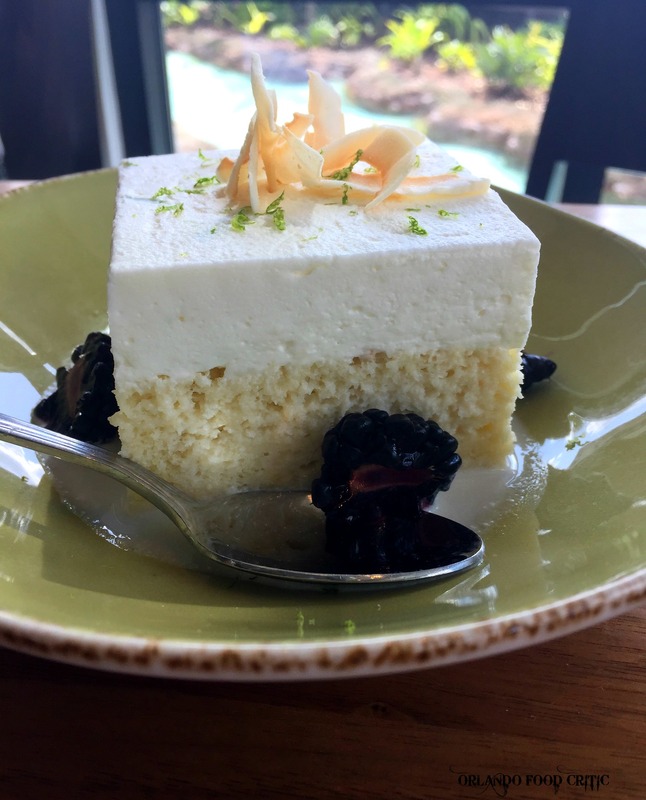 Coconut Lime Quatro Leches – Sponge cake soaked with four milks topped with whipped cream, toasted coconut, fresh blackberries and lime zest. As opposed to Tres Leches, the extra “Leche” comes from a delicate Coconut milk addition, making a light dessert that is deceptively simple but refreshes your palate and you are sure to order again and again. 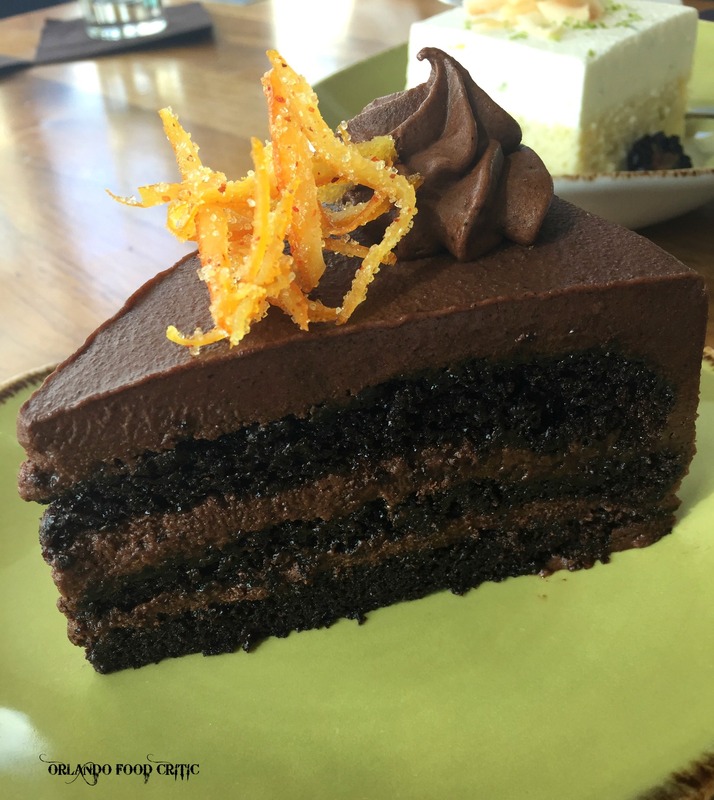 Ancho Chile Chocolate Cake – Triple layer moist chocolate cake, Ancho Chile chocolate frosting and topped with candied Tajin orange zest. If the decadent moist chocolate cake was not enough, the slight “Kick” from the Ancho Chile and the perfect candied zest make this dessert a Fiesta in your mouth and not to be missed. Desserts are all freshly made “In House”, under the watchful eye of Executive Chef Christian Torres. Frontera Cocina also serve a great coffee using Mexican Natural Coffee grown by small family farmers in Zihuatanejo Mexico and perfectly roasted at Colombia Street Roastery, giving the coffee strawberry and cinnamon notes and cocoa undertones. A real good cup of coffee! The team at Frontera Cocina Mexicana treat the quality ingredients with respect and serve them with passion, so whether you are an Orlando local or visiting Florida, make sure you head on over to Disney Springs and please get to know the delights of authentic Mexican food at Frontera Cocina Mexicana. You can also meet the Frontera Team and sample some of their delicious food at the Mexican Food Festival at Gaston Edwards Park Ivanhoe Village on March 24th. We will be posting the Frontera Festival Menu next week, watch out for updates.